In response to Bashar Al-Assad’s use of nerve gas to attack his civilian population, President Donald Trump ordered an attack on the Syrian airport Assad’s Air Force used to launch the attack. Now what? 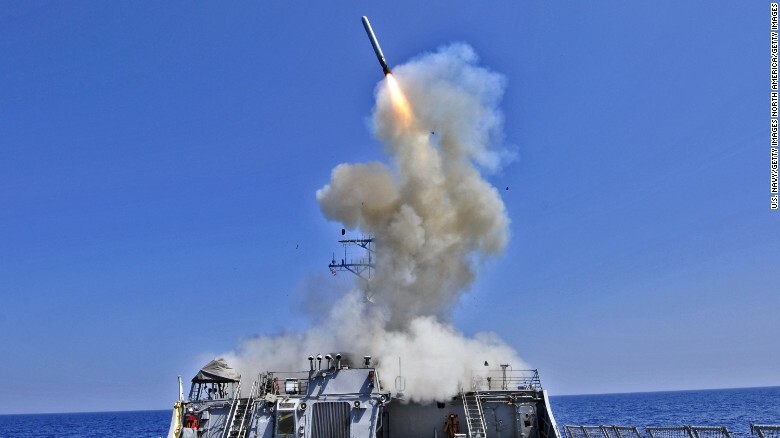 It isn’t so clear what exactly Trump hoped to accomplish by lobbing a reported 50 + Tomahawk missiles at the airport from two Navy warships stationed in the eastern Mediterranean. One prominent theory making the rounds is that Trump used this as a way of “sending a message” to North Korea’s Kim Jong-un. Buttressing this argument is the Pentagon’s announcement that a U.S. Navy aircraft carrier-led strike group is headed toward the Korean Peninsula. It is apparently meant to be a show of force. In the short run, Trump’s response to the Syrian use of a gas attack on civilians provided him with the opportunity to reap lots of political benefits without taking any appreciable risk. For one thing, it pretty much demolishes the argument, fashionable in the Resistance, that Trump is a tool of the Russians. After all, it was the Russians who negotiated a deal with then Secretary of State John Kerry to take control of and destroy Syria’s WMD, including poison gas. It is now abundantly clear (to the surprise of no one except perhaps John Kerry and Barack Obama) that Syria and Russia had no intention of doing any such thing. The only question now is whether Russia was actively complicit in the actual gas attack. The larger geo-strategic question is whether the Trump Administration is about to toss the populist nationalism overboard and begin to reassert U.S. leadership in world politics after 8 years of atrophy under the Obama Administration. That is certainly plausible, especially given the fact that political advisor Steve Bannon has been cut down to size, particularly with respect to foreign policy. But it runs directly counter to the forces that got Trump elected in the first place. At the heart of the Trump Presidency there is an insoluble political / economic dilemma. His (for the moment) politically popular protectionist economic policies are on a collision course with his need to increase economic growth. Supply chains and finance are global. The leg bone is connected to the thighbone so to speak. Serious disruptions in global financial markets and supply chains would be economically and politically catastrophic. While Trump professes to be a non-interventionist in foreign affairs, he jumped into the Syrian civil war at the first opportunity. It is not clear why. A pinprick will not dissuade Assad from his determination to retain power at any price. Moreover, a pinprick without any follow-up would leave Assad in a more powerful position, something that would not escape notice in Pyongyang. So the question remains. Does President Trump intend to begin reasserting U.S. leadership in the world? If so it is going to require working with allies, keeping the U.S. economy open, increasing funding for the military, and getting the U.S. government’s fiscal position on a path to solvency. Which is to say, pretty much the opposite of what he has been promising from the beginning, with the possible exception of increased military spending. The Conservatives who cheered Trump along ought to be getting pretty nervous thinking about this. Trump has given no indication of anything remotely resembling a coherent view of world politics, much less a governing philosophy. That’s probably because he doesn’t have one. He has instead shown himself to be a remarkably ignorant man, who lacks intellectual curiosity, and who prefers to think of himself as a practical businessman. All of which means that there is no telling what he will do, or why he will do it. That is hardly a conservative approach. In fact, his approach thus far seems more Wilsonian than anything else, but it is still early in the game. Conservatives and libertarians should not be comfortable with Trump taking action after announcing that his thinking had changed because of pictures he saw on television. If he is to gain the support of policy intellectuals on the conservative / libertarian side, he is going to have to enunciate a coherent doctrine that describes the world the way it actually is, what U.S. goals are, and the means to achieve them. Reasserting U.S. leadership in an increasingly fractious world after 8 years of Obama’s neglect is also going to require the assent of the citizenry, which means leadership at home. Leadership is not a quality Trump has demonstrated to date, unless you call rants in stadiums before worshipful followers leadership. The foreign policy catastrophe produced by Obama demonstrates the need for U.S. leadership in world politics. It is not clear if Trump is up to the job. It is disconcerting to hear all the calls for a policy on Syria, North Korea, and general principles from the White House and note that we are not hearing prospective policies from either Republicans or Democrats in Congress or from the think tanks. I’m waiting to hear foreign policy strategies from anybody at this point.